Manufacturer of a wide range of products which include 5 kv high voltage tester, high voltage potential transformer tester, high voltage tester, 100 kv high voltage tester and 150 kv high voltage tester. 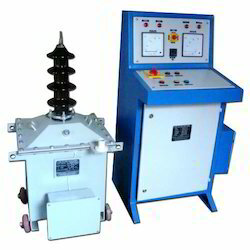 We are one of the eminent names engaged in manufacturing and supplying of quality prone 5 KV H.V. Testers. Primarily used in power/distribution transformers for measuring breakdown/dielectric strength of insulation, these are highly appreciated among our clients. These testers are offered to our clients with manually or motorised operated dimmer with zero start switches. Designed as per the specific requirements of our clients, both Digital and Analog Meters both are offered with Timer & Flasher Light. Backed by a diligent team of technicians, we are engaged in offering our clients with High Voltage Source. These are well received in the industry, for their superior performance and durability. 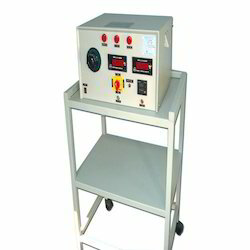 We are a leading manufacturer and supplier of High Voltage Tester to our valuable clients. 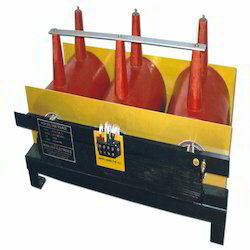 We put in our best to provide our clients with 100 KV High Voltage Tester. These panels are manufactured using high quality material and latest techniques. Our technicians make sure that these are in compliance with international quality standards. These can be tailor made as per the requirements specified by our clients. 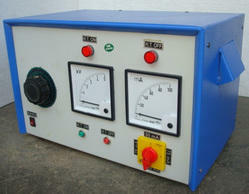 We are one of the leading manufacturers and suppliers of High Voltage Transformer with Control Panel/ H. V. Testers. These are offered with high voltage P. D. free transformer with fiber glass tank. Tanks are provided as per the requirements for H.V. test & Partial discharge test. The current of the testers are offered with Analog KV meter, mili Amp, Meter & Timer, as per the requirements of our clients.